Last night, something went terribly wrong with Overwatch’s best team. It became apparent early on in a match, when Do-hyeon “Pine” Kim, New York Excelsior’s unstoppable, sawed-off shotgun, switched off the sniper hero who made him famous and onto Doomfist, a character notorious for being high-risk but high-reward. This time, there was no reward. The 100,000 viewers tuning in to last night’s Overwatch semifinals watched in awe as Kim rocketed onto the scene. In 40 desperate seconds, he feebly tossed opponents around, struggled to land kills, then died. NYXL scrambled. The night ended with a shocking 3-0 loss in favor of the Philadelphia Fusion. Now, NYXL looks much worse for wear with only one week left before the League’s playoff finals, disconcertingly set in New York City. For three of four Overwatch League stages, Excelsior has dominated, suffering only one loss in each stage out ten games total. Seemingly unflappable, they entered Stage Four in May. This time was different. There had been changes to the game. Overwatch tweaked the sniper Hanzo and added an entirely new character, Brigitte, and that combo has nearly killed the game’s most dominant strategy: diving behind the enemy team and massacring their backline. Over the course of the season, the Excelsior has elevated that strategy into an art form, but their reign might have ended. Worse, Brigitte is a hard counter to Tracer, the top hero for NYXL’s star assassin Jong-ryeol “Saebyeolbe” Park. Fans theorized that NYXL was losing on purpose, or “sandbagging.” As caster Christopher “MonteCristo” Mykles assessed last month in a game that went the Los Angeles Gladiators’ way, NYXL had nothing to lose. They’d locked down the first seed. They didn’t have to put in their all. Other fans argued that the players were keeping their best strategies secret so they’d dominate during the season playoffs. A debate broke out among OWL fans, one side arguing NYXL was sleeping on the job, the other maintaining that they were reserving their best plays for when it mattered. Both narratives hinge on the idea that the League’s best team was intentionally not trying their best, either out of laziness or forethought. Last night, we learned, that might not be the case. It looked like the team was trying. And they still lost. The Philadelphia Fusion are known to be scrappy, emotional, high on their own momentum—when they hit their stride. Against NYXL, known as a meticulous and calculated team with a strong defensive streak, the Fusion had mixed success. Yesterday, Philly’s adaptiveness won out. They ran a lot of Hanzo and countered NYXL’s Saebyeolbe with Brigitte, the new strategy that has become NYXL’s kryptonite. They targeted Jjonak mercilessly. And they capitalized on Pine’s volatility. NYXL, on the other hand, couldn’t adapt. They weren’t bad—just outplayed. NYXL’s consistency, once their greatest asset, became its downfall. On Saturday, NYXL will go up against the Fusion again in two more games. If they lose, Fusion will advance. And the playoffs will happen in New York without the Excelsior—or at least, without them in the ring. 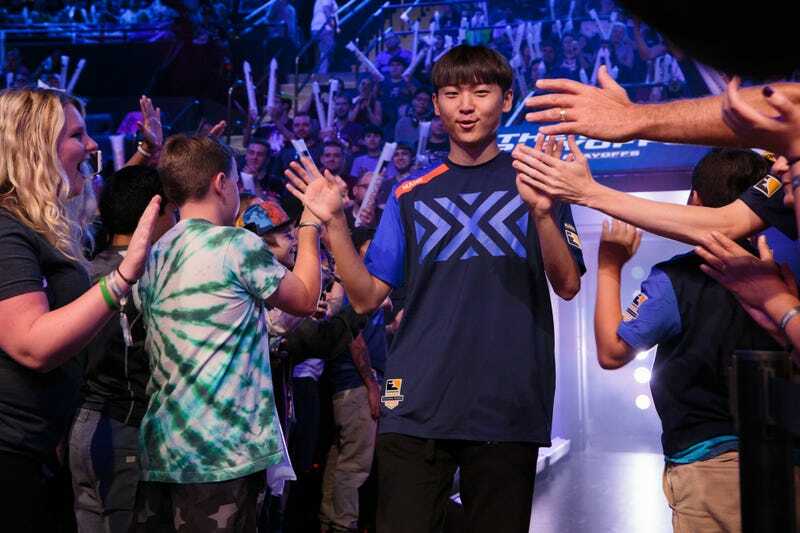 The team has arranged various homecoming activities for local fans, which an NYXL spokesperson says will be a “celebration of the team’s season” overall. That “celebration” might be a bittersweet one.